Life-Cycle Analysis (LCA) calculation tools can be valuable resources for designers, builders, building officials and even consumers trying to determine the environmental impact of building products and materials. These calculators are available from a variety of sources and vary in their intended users and information. There are a few popular free LCA tools online. Athena Sustainable Materials Institute has a variety of LCAs on their website. The EcoCalculator was their entry-level LCA tool intended to make life cycle assessment easily accessible for building design teams. Athena recently replaced it with the Impact Estimator, a more robust version designed on the same basic premise as the simple Excel-based EcoCalculator. Sustainable Materials Management Coalition recently completed a report on the value of LCAs, which is recapped with information as well on the Athena calculators in a recent GreenBuilding.com article LIfe-Cycle Assessment for Dummies. The Athena calculators are commendable for their effort to assist architects, designers, builders and government officials with assessing the economic impact of products and materials. However, these do not include detailed comparisons on insulation products. This is unfortunate since the environmental characteristics of insulation products vary greatly. All of the most common insulation materials help to minimize the environmental “footprint” by improving energy efficiencies of homes and buildings. However, they can differ greatly when compared in a “cradle to grave” or “all lifestyle stages” analysis taking into account recycled content, embodied energy and similar factors. The fact is, of the leading building insulation products none can match the environmentally beneficial characteristics of cellulose insulation. It combines high recycled content and insulation properties with low embodied energy and transportation impacts helping to reduce the footprint in combination with other low impact products and materials. CIMA appreciates the time and effort Athena and other organizations have devoted to make these important LCA calculators available. Hopefully, as they continue to evolve, detailed information about building insulation can be included to allow comparison of various types of products for this critical construction component. For now, CIMA encourages everyone trying to make life-cycle assessments of homes or buildings to include comparison of insulation materials. 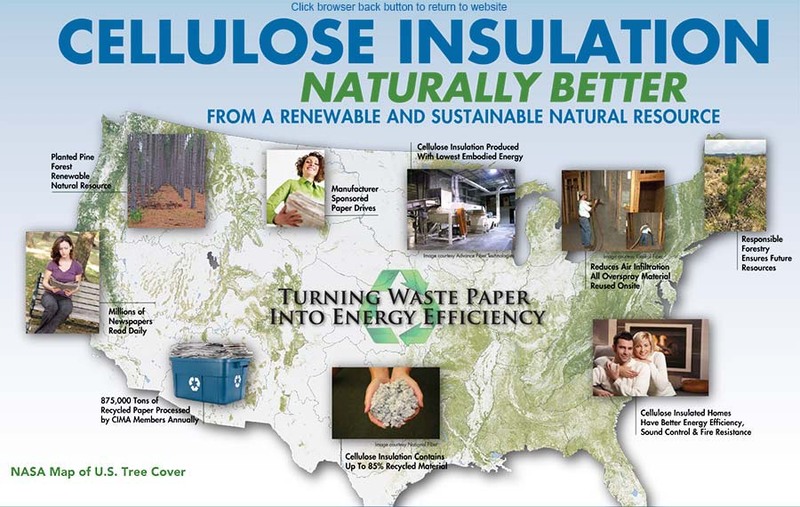 We believe such comparisons will clearly show cellulose is the best choice where the goal is lowering the environmental footprint while achieving highly insulated homes and buildings. This entry was posted in Cellulose Insulation, Green Building, Green Products, News & Information. Bookmark the permalink.